The stability and static trim of a scuba diver affect the convenience and safety of the diver both at the surface and under water during the dive. Underwater trim is at approximately neutral buoyancy, but surface trim may be at significant positive buoyancy. Surface supplied divers may also find trim important if they operate at neutral buoyancy. 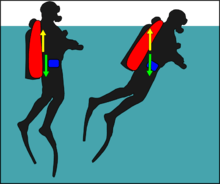 When the buoyancy compensator of a scuba diver is inflated at the surface to provide positive buoyancy, the positions of the centre of buoyancy and centre of gravity of the diver are generally different. The vertical and horizontal separation of these centroids will determine the static trim of the diver at the surface. The diver can usually overcome the trimming moment of buoyancy, but this requires constant directed effort, albeit usually not a great deal of effort. This allows a conscious diver to adjust trim to suit the circumstances such as the choice between swimming face down or face up, or remaining vertical for best field of view or visibility. 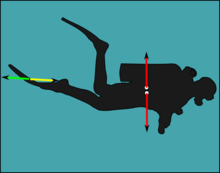 The position of the diver's centre of gravity is determined by the distribution of weight, which is in most cases determined by the actual equipment in use. Trim of the centre of gravity is usually achieved by selection of cylinder material and positioning of main ballast weights and trim weights. Aluminium cylinders are generally less negatively buoyant than steel cylinders of equivalent capacity, and high pressure cylinders more negative than low pressure cylinders of the same material. 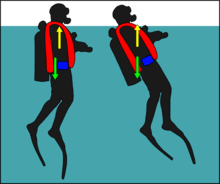 Similarly, much of the diver's buoyancy is determined by the equipment in use, particularly the buoyancy compensator, which can significantly influence centre of buoyancy shifts as it is inflated and deflated. Stable trim implies that the centre of buoyancy is directly above the centre of gravity. Any horizontal offset will generate a moment which will rotate the diver until the equilibrium condition is restored. 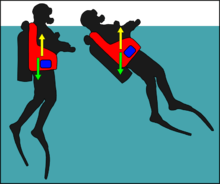 Several cases are possible for an upright diver at the surface. This attitude is stable only when the centre of buoyancy is nearer the head then the centre of gravity, and on the same vertical line. Otherwise the diver will tend to rotate forwards or backwards until the centre of buoyancy is directly above the centre of gravity. In almost all cases the centre of buoyancy is nearer the head than the centre of gravity, and buoyancy compensators are all designed to provide this as the default condition, as an inverted diver floating at the surface is at risk of drowning. The lateral offset of centre of buoyancy from centre of gravity is generally insignificant unless the diver has been weighted asymmetrically between the sides, which is unusual, and seldom intentional, though it can occur when weights are ditched or lost from one side only. There can be a conflict between the requirements for good surface trim and large reserve of buoyancy, particularly with back inflation systems, where a large volume is more likely to move the centre of buoyancy further back than the centre of gravity, and moving the centre of gravity further back by shifting weights may compromise trim stability at neutral buoyancy. There is also a conflict between the requirements for a lifejacket, which must keep the wearer face up and afloat even when unconscious, and a buoyancy compensator, which should allow the diver freedom to control trim attitude both underwater and floating at the surface. Diving buoyancy compensators are generally labelled with a warning that they are not a substitute for life jackets. Ditching weights at the surface will move the centre of gravity slightly further back if the weights were carried forward of the centre of gravity, and in almost all cases will result in a stable condition where the diver is more horizontal in the water. Underwater trim is the diver's attitude in the water, in terms of balance and alignment with the direction of motion. Accurately controlled trim reduces swimming effort, as it reduces the sectional area of the diver passing through the water. The effect of swimming with a head up angle, of about 15° as is quite common in poorly trimmed divers, can be an increase in drag in the order of 50%. A slight head down trim is recommended to reduce downthrust during finning, and this reduces silting and fin impact with the bottom. The free-swimming diver may need to trim erect or inverted at times, but in general, a horizontal trim has advantages both for reduction of drag when swimming horizontally, and for observing the bottom. A horizontal trim allows the diver to direct propulsive thrust from the fins directly to the rear, which minimises disturbance of sediments on the bottom, and reduces the risk of striking delicate benthic organisms with the fins. 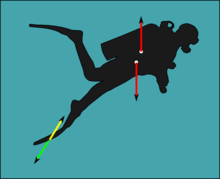 A stable horizontal trim requires that diver's centre of gravity is directly below the centre of buoyancy (the centroid). Small errors can be compensated fairly easily, but large offsets may make it necessary for the diver to constantly exert significant effort towards maintaining the desired attitude, if it is actually possible. 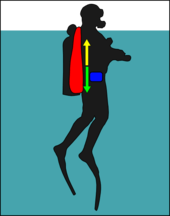 The position of the centre of buoyancy is largely beyond the control of the diver, though the cylinder(s) may be shifted in the harness by a small amount, and the volume distribution of the buoyancy compensator has a large influence when inflated. Most of the control of trim available to the diver is in the positioning of ballast weights. The main ballast weights therefore should be placed as far as possible to provide an approximately neutral trim, which is usually possible by wearing the weights around the waist or just above the hips on a weight belt, or in weight pockets provided in the buoyancy compensator jacket or harness for this purpose. Fine tuning of trim can be done by placing smaller weights along the length of the diver to bring the centre of gravity to the desired position. There are several ways this can be done. Ankle weights provide a large lever arm for a small amount of weight and are very effective at correcting head-down trim problems, but the addition of mass to the feet increases the work of propulsion significantly. This may not be noticed on a relaxed dive, where there is no need to swim far or fast, but if there is an emergency and the diver needs to swim hard, ankle weights will be a significant handicap, particularly if the diver is marginally fit for the conditions. Tank bottom weights provide a much shorter lever arm, so need to be a much larger proportion of the total ballast, but do not interfere with propulsive efficiency the way ankle weights do. There are not really any other convenient places below the weight belt to add trim weights, so the most effective option is to carry the main weights as low as necessary, by using a suitable harness or integrated weight pocket buoyancy compensator which actually allows the weights to be placed correctly, so there is no need for longitudinal trimming. A less common problem is found when rebreathers have a counterlung towards the top of the torso. In this case there may be a need to attach weights near the counterlung. This is usually not a problem, and weight pockets for this purpose are often built into the rebreather harness or casing, and if necessary weights can be attached to the harness shoulder straps. At most times during a dive the Buoyancy compensator is only partially filled, and the air in it will rise to the highest part of the bladder that it can reach without having to flow downhill on the way to get there. This may cause air to be trapped in one side of the bladder at times, which may upset the trim by rotating the diver so that the side with more air in it shifts upward. This is particularly prevalent with horseshoe style wing bladders, where there is not connection between the sides at the bottom of the wing. This is seldom much of a problem, and can be corrected by simply trimming the shoulders up until the air balances between the sides. 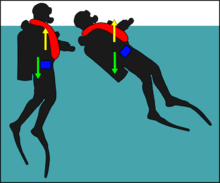 It does however mean that if the diver rolls to one side air will shift to the upper side and tend to hold the diver in this position. Similarly if a diver trims steeply head up or down, the air will flow to the higher end of the BC and this will tend to keep the diver stable in this position. This can be exacerbated by similar but more extreme air shifts in a dry suit, which is the main reason why dry suits should be dived with the minimum air necessary to expand the undersuit. ↑ Passmore M.A, Rickers, G. (2002), Drag levels and energy requirements on a SCUBA diver Sports Engineering 2002, 5, 173-182, Blackwell Science ltd.
Jablonski, Jarrod (2006). Doing it Right: The Fundamentals of Better Diving. Global Underwater Explorers. ISBN 0-9713267-0-3. This article is issued from Wikipedia - version of the 5/7/2014. The text is available under the Creative Commons Attribution/Share Alike but additional terms may apply for the media files.